This is the firm that has created perhaps the most loyal customer base in history. Back in the 1990's, a hockey player named Mark Messier was known around New York City as "the Money Man". Messier earned this moniker through his habit of coming through in the clutch. After leading his old team, the Edmonton Oilers to a bevy of Stanley Cup championships over the prior decade, he had done the impossible, and led the New York Rangers to a championship all their own in 1994. There's a new "Money Man". Actually, not really all that new. These days, the term refers to Amazon (AMZN - Get Report) CEO Jeff Bezos, the planet's richest man. Yesterday, Bezos made news, a ton of news. First, he and his wife MacKenzie announced the formation of the Bezos Day One Fund that will support existing organizations that aid homeless families. The new fund will also create a network of pre-schools in low income areas. Bezos has committed $2 billion of his estimated personal wealth of $164 billion to this new charity interest, and has clearly shown an increased interest in philanthropy of late. Bezos spoke in Washington last night. Hopes were that he might mention his decision on a winner for where Amazon might locate their second corporate headquarters. Those hopes were dashed early on in the event when Bezos indicated on that he would answer that question by the end of the year. The crowd in attendance actually booed (somewhat good-naturedly) this avoidance. Jeff Bezos was careful not to pick a fight with the president throughout the interview with David Rubenstein. In defense of his Washington Post, he did express his belief that it would be dangerous for any elected official to demonize the media, but that is about as far as he went on that. As far as Amazon (Bezos holds a 16% stake) goes, he expressed a broad understanding that large companies will come under regular scrutiny. He took a pass when asked about presidential tweets aimed at the firm. Basically, it seemed to be a "stay out of trouble" interview. Retailers call this firm the "Death Star". Cloud Kings call Amazon Web Services ... number one. This is the company that has forced Walmart (WMT - Get Report) to evolve just so they might compete. This is the firm that through Prime membership has created perhaps the most loyal customer base in history, not to mention the subscription economy. Speaking of Prime, Citigroup analyst Mark May mentioned Prime when he raised his target price on AMZN from $2100 to $2250 earlier this week. May expects membership to grow to 275 million by the year 2029 from the already whopping total of 101 million at the end of 2017. Going to need the rest of the developed world for that one. 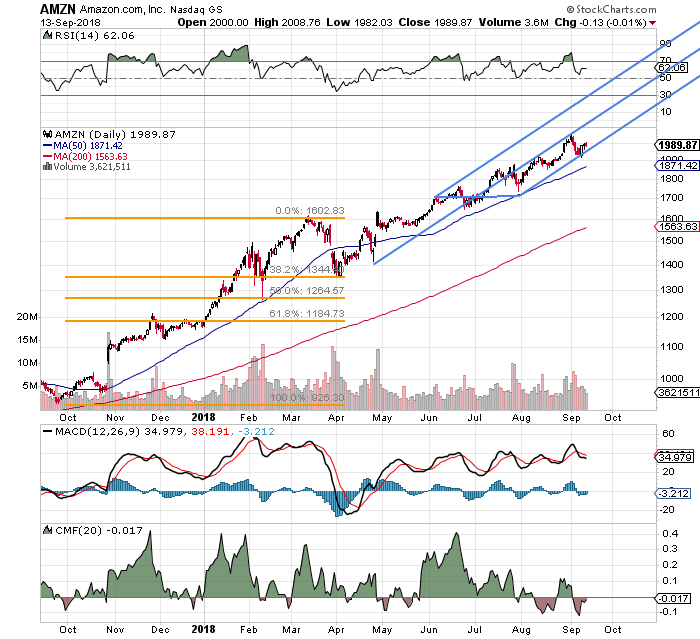 Why do I call Amazon, the last FANG standing? Well, for starters, it's the last one that I still have a position in. I jettisoned the tail end of my long position in Alphabet (GOOGL - Get Report) a couple of weeks back. I still will play Netflix (NFLX - Get Report) through the options market from time to time, but have not really had a conviction there for months no. I never did have a position in Facebook (FB - Get Report) . Yes, I missed a lot of upside with that one. I also skipped a lot of pain this summer for those shareholders. Honestly, I have just always considered Facebook just too poorly managed a company for me to get involved with. There is recent Amazon news, but I don't think lower prices at Whole Foods, or Go stores are really going to be game changers. The market-share that this firm has built in the consumer convenience retail space, and in the fastest growing business maybe ever... the cloud will, I believe continue to differentiate this firm from it's (if it really has any) peers. Money Flow looks a little soft. So does the daily MACD. That's really nothing compared to what has happened to the rest of FANG. Blame ETFs, and passive investment. You can use my Pitchfork, or you can use the 50 day SMA. The stock always seems to pivot around that trailing indicator as it climbs. Perhaps, I may use that area to increase my long position on any sustained pull-back. My price target remains a below consensus $2100. We all know about the $2500 target that Morgan Stanley's Brian Nowack placed in this stock toward the tail end of August. I will wait until my target is both pierced and held on at least one test before I make a change. The industry average, for your information is now $2162, up 20 bucks from two weeks ago.